Born Timothy Stephen Wakefield on the 2nd August 1966, in Melbourne, Florida USA, he is a retired baseball pitcher who played for the Boston Red Sox and Pittsburgh Pirates of the MLB. His career was active from 1988 from 2011, and he was the oldest active player in the MLB, before retirement. 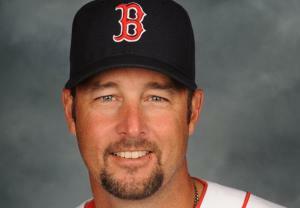 Have you ever wondered how rich Tim Wakefield is, as of mid-2016? According to authoritative sources, it has been estimated that Wakefield`s net worth is as high as $23 million, an amount he has earned through his successful career in baseball, during which he amassed a total of 2,156 strikeouts, and is the first on the all-time list for most innings pitched for the Red Sox with 3,056. Tim grew up in his hometown; he went to the Eau Gallie High School, and after matriculation, he enrolled at Florida Tech University. While in college, Tim started playing baseball, and was quite successful. He earned recognition as the Panthers team MVP as a first baseman in sophomore and junior seasons, and also set the record for most home runs in a season with 22 and had 71 RBI, which is also the highest number achieved by a player in one season. Years later, his jersey number 6 was retired by Florida Tech. After college, Tim declared for the 1988 MLB Draft, in which he was selected by the Pittsburgh Pirates. Although a scout told him that he would never reach the majors, Tim didn`t surrender and started practicing a knuckle ball, which later made him so well known on the baseball fields. Four years after the draft and playing in minor leagues, he made his debut appearance, but played for the Pirates only one season, and with several breaks as he struggled, before he was eventually released by the team`s officials. Anyway, it turned out to be the best thing to happen to him, as he signed a contract with the Boston Red Sox, just six days after his release by the Pirates, and subsequently played for the Red Sox until his retirement in 2011. Thanks to his great performance for the team, Tim`s net worth increased significantly over the years, as he signed several contracts, including for $4 million for a year in 2005, and $5 million over two years in 2010. During his career, Tim won several prestigious awards and honors, both as a part of the Red Sox, and as an individual; he was selected for the All-Star game in 2009, and has won the World Series twice, in 2004 and 2007, but in the second successful finals, he was left out of the team, as he had problems with a shoulder injury. Also, Tim won the Roberto Clemente Award in 2010, and as the pinnacle of his career, Tim was inducted into the Boston Red Sox Hall of Fame. After his retirement, Tim joined NESN, working as an analyst and commentator, covering the games of the Boston Red Sox. Also, his net worth increased thanks to his business ventures, starting a restaurant with hockey player Shawn Thornton, and most recently he became a spokesperson for Farmington Bank. Regarding his personal life, Tim has been married to Stacy Stover since 2002; the couple has two children. Tim is also recognized for his philanthropic activities; he has been hosting celebrity golf tournaments, which serves as fund raiser, and has also collaborated with the Franciscan Hospital for Children. Since 2013 he has been in the position of Honorary Chairman of the Red Sox Foundation, among many other activities. 1 Inducted into the Florida Tech Sports Hall of Fame in 1993. 2 Inducted into the Sunshine State Conference Hall of Fame in 1997-98. 3 Was named to his first All-Star team in 2009 at the age of 42. 4 Daughter Brianna Grace, born December 29, 2005. 5 Almost exclusively caught by Doug Mirabelli until Mirabelli was traded after the 2005 season. Mirabelli was known to be the only catcher able to keep up with Wakefield's knuckleball. 7 Bears an incredible resemblance to country superstar Tim McGraw. 8 (Oct 17, 2003) Gave up walk-off home run in the 11th inning of Game 7 of the AL championship series to Aaron Boone of the Yankees, allowing New York to advance to the World Series with a 6-5 victory over Boston. Although the Yankees would eventually lose in the World Series, many consider this to be one of the greatest moments/games in MLB history.